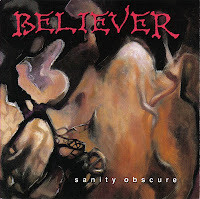 Not only was Sanity Obscure a pretty dramatic improvement over the technical thrashing Believer debut Extraction from Mortality, but it also brought the band to the attention of a larger audience through a deal with Roadrunner Records, which had been exploding for years with a number of masterful albums in numerous sub-genres, and had a higher visibility than the band's Christian label R.E.X. Music (home also to bands like Sacrament, Detritus and Living Sacrifice). Interestingly, this is not such a massive change in terms of its song- and soundscaping: the riffs are just that much better, and there's a more immediate sense of chaos and tension manifest through the guitars and vocals. Those angry and incendiary Christian lyrics from the debut remain, but only on about half the songs; the rest are quite thrash-friendly and topical to events that were (and still are) a big deal to an audience whose unrest and political ideas were often embodied in the music that inspired them; for instance, "Nonpoint" and its environmental theme borne straight out of the 80s, but relevant even today. It helps a great deal that the sophomore opens with what are, in my estimation, the best two Believer cuts in their entire catalog. "Sanity Obscure" opens with freakish tones of disjointed nursery rhymes, almost like it were being played at you through the loudspeaker of some psychotic ice cream truck; and then comes a dissonant build into a simplistic thrash break, and then the Pennsylvanians unleash a heavenly host of cinders and ash through their taut, precision riffing. "Wisdom's Call" is Christened with a groovy beat before its own meaty guitars erupt into a splendorous, surgical display of palm muted harmonies. There remains that dense, industrial grade soullessness to the guitar tone, but I feel like the lows and highs of the strings are better captured, and thus the muscle of each progression really hits the listener in the gut. I'd compare it to the Teutonic gods Destruction, but I'd be thinking more of their 2000 and beyond reunion era, albums like All Hell Breaks Loose or The Antichrist. Though furious enough to satisfy the audience of West Coast thrash like Dark Angel or Exodus, I'd actually go one further and say that the way Kurt Bachman and Dave Baddorf formulated the riffs on this thing are clashing, compact and chaotic enough that they might satisfy fans of adventurous Floridian death/thrash outfits like Atheist, Cynic, Hellwitch or later Death. I even prefer it to much of those bands' output (I'd take it over Piece of Time, for example), even if it's not so dextrous, jazzy or technically profound. Bass is still an issue, but even if it's not as compelling as, say, a Roger Patterson or Tony Choy, it buzzes and burps along here with more of an intensity and distinction than on the debut. Additionally, the drums feel more fleshed out, with a nice snap to the snare, and some more flexible double bass and near blast work, though like most thrash acts the beats were influenced more through rock and punk music. While they don't abandon that hacking, angry inflection they possessed on the debut, Bachman's vocals also seem better rounded. You can make out more of that tortured decay in the longer syllables, and he definitely feels like he's crawling along the Emergency Room floor with a burst appendix or some other tangible, unshakable form of physical pain wracking his entire person. They continue to play around with the idea of orchestral ingredients, this time largely through the incorporation of the female operatic vocals and symphony in "Dies Irae (Day of Wrath") which persist through the nearly six minutes of the track; for sure one of the earliest examples of an extreme metal band implementing such strings and sound design alongside the heavier fare. A less seamless fit than you'd hear on, say, Into the Pandemonium, but quite fitting to the manic intensity of Believer's metal riffing. Really, any 2-3 of the originals on this album would provide me with more replay value and choice riffage than the entirety of Extraction from Mortality, but Sanity Obscure is also about 6-7 songs deep in terms of consistent quality and coherent variation. Not until the cover of U2's "Like a Song" do I feel an urge to skip a track, and in their defense, they at least inject that with some punky/thrash enthusiasm while attempting to maintain The Edge's sense for atmospheric playing. The CD reissue contains an instrumental bonus track called "I.Y.F." which is a more harmonious use of the two guitars, but this also has rougher production values as it hails from their 1987 demo The Return. Ultimately, this has proven the sturdiest of their full-lengths to date, sounding just as fresh and pulverizing as it was the first time I laid my hears on it, and with great haste I would recommend this to the connoisseur of technical thrash or death/thrash metal, provided he or she doesn't mind sharing a seat with Jesus for just the one bus ride. A refined, evolutionary stopgap between the Bay Area and Teutonic thrash tones of the late 80s, and the emergent fusion of progressive Florida death.